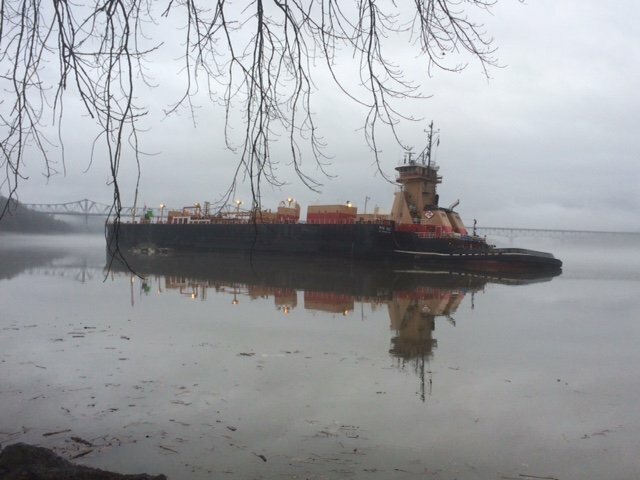 We are very fortunate that there was no spill today when a barge carrying 60,000 barrels of gasoline ran aground on the Hudson near Catskill. We are fortunate that all the barges carrying petroleum on the Hudson are double-hulled, which gives much greater margin of safety. However, this is another example of how accidents happen, even with our highly qualified tugboat crews and sophisticated, state of the art navigation equipment. Remember the tanker that ran aground in 2012 with 12 million gallons of Dakota crude oil on board. When there’s more transport, there are more accidents. It’s common sense, and it’s common knowledge. In places like Galveston, Texas, where there’s much more oil being moved, much more is being spilled. We don’t want toxic crude oil to be spilled in the Hudson. Aside from the environmental damage that an oil spill would cause, seven of our Hudson River communities draw their drinking water directly from the Hudson. Riverkeeper and thousands of people and communities spoke up and commented to the Coast Guard last year regarding proposed additional anchorage grounds, which the tug and barge industry requested to facilitate the anticipated increase in the trade of American Bakken crude oil. We don’t want that increased transport of Bakken oil on the Hudson, precisely because accidents happen, and crude oil, poisonous to the life in the river, cannot be recovered from a moving body of water like the Hudson. A gasoline spill does not have the same consequence. When gasoline is spilled on water, as we understand it, the strategy is to let it spread out and vaporize into the atmosphere. (The biggest risk is fire and explosion, rather than environmental damage.) That’s impossible with crude oil. We continue to urge the state to undertake a comprehensive environmental review of the permits that allow North Dakota crude oil to be shipped down the Hudson by barge. It is essential for the Department of Environmental Conservation to fully understand the consequences of moving crude oil on the Hudson River. Should crude oil be shipped by barge on the Hudson at all considering that there are no effective recovery methods for a crude oil spill in a moving body of water? This incident reminds us that we should not wait for the worst-case scenario to occur before we take the necessary steps to protect our environment, our communities, and our drinking water.